This Sunday, the 11-3 Philadelphia Eagles, will face the San Francisco 49ers, who are looking to play the role of spoiler as the Eagles control their own destiny and can clinch home field advantage by winning their final two regular season games. Not too long ago, Birds fans were disappointed with their team's performance as the Eagles started the season. They lost their first two games at home, and were lucky to be saved with a Bye-week. But since then, all cylinders have been pumping as the Eagles are now soaring as one of the top teams in the NFC, and riding a nine-game winning streak. Now that a playoff spot has been clinched, there is no room for letdown as many of the Birds' preseason goals are within reach with a win this Sunday versus the Niners. The Eagles can clinch their third straight NFC East championship with a win and will lock up home field advantage with a St. Louis loss. Also, the Eagles are on the verge of breaking their own team record for nine straight wins set in 1960, which oddly enough is when Philadelphia won the last of its three NFL Championships. However, don't expect the Niners to simply lie down and allow the Eagles to roll right through to the playoffs. Despite not having a road win this season, the 49ers have totaled a league best 88 points in the last two weeks and are playing some of the best offense in the NFL right now. Although, a Niners loss will mark the first time since 1979 that the team has failed to win on the road. Coming into Sunday's game, the Niners have not lost in Philadelphia since 1975, winning their last four times here. But perhaps the Linc will provide for a different atmosphere. This Sunday will be a forum for records and decisions, with the Eagles looking to break records and win the NFC East championship, and the Niners looking to avoid that streak of zero road wins. Both teams will bring their A-game, so it should definitely be one for the record books. The first half of this shoot out was one of the more exciting halves of the season. Whenever you get to see 41 points scored , it has to keep you coming back for more. The Eagles came out on the first down of the game and Donovan went deep to Pinkson for a 59 yards completion. Then they cap off their first drive with a 21 yard Brian Westbrook TD run. Exciting way to start. The second TD was set up by a long completion pass to Thrash. Followed by a Donovan QB sneak. 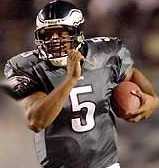 But my favorite TD was a pretty 25 yard TD pass by Freddie Mitchell to Brian Westbrook. Donovan lateraled to Freddie who hit Brian in the corner of the endzone for the TD. Hi five all around. Dawkins had a nice half with an interception and a booming hit on Ricky Williams to put him on the sidelines for a while. Total yards first half for the birds was 263 yards. In the second half there wasn't quite as much scoring. Donovan had another good game going 15-27 for 236 yards. And one interception. Speaking of the pick, the replay showed the ball hit the ground and not just LG's foot. But Donovan really came up big late in the game when the Eagles were on their own 5 yard line and he ran the ball 2 times and got a critical first down. Big time kudos to OT Artis Hicks whose name wasn't heard for giving up sacks. Let's not forget that he filled in for an All-Pro Tra Thomas who was out with a bad back. Duce with another solid game and let's not forget our best weapon, Brian Westbrook who had 2 TD's and over 100 over all yards. And just one more Kudo...for the thousands of fans who made themselves heard in Miami. The end of the game sounded like we were in Vet stadium again. It was an awesome game. That's nine in a round for those who are counting. The Eagles are now 12-1 under Andy Reid on Monday Nights . Just 5 more games to win and we will be SuperBowl Champs. It's our destiny this year. Enjoy the final 5 games. I will.